I had some problems with photos uploading, but as you see everything is okay right now ! yeey. 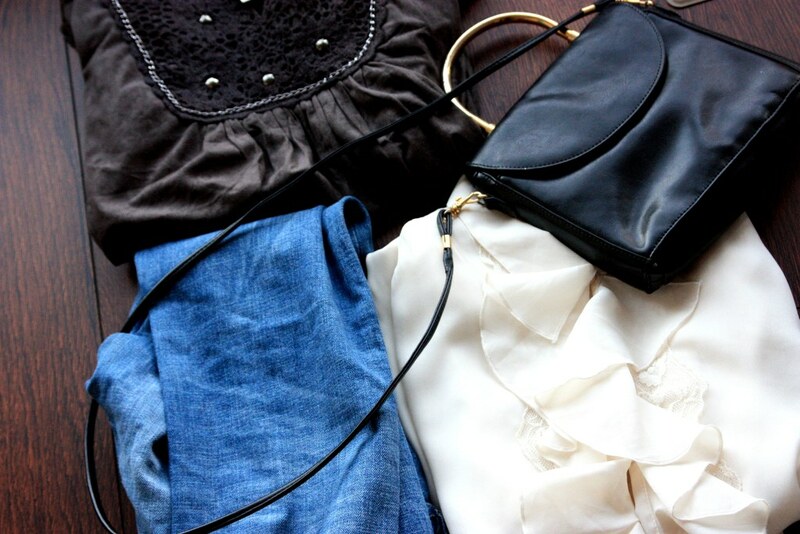 Today I have prepared a little post about my new buys from a second-hand shop. Actually, I really love to go to those places which are full of cheap, however sometimes very stylish, unique garments. And what I love the most about that is that it's just a little chance to meet someone with the same ones. What I usually do I recreate those buys with some interesting details, rivets or various strips to make tham more unusual. I think that today was a really lucky day, because I have found these beauties ! I always dreamed about those "boyfriend" jeans and now I have it. What I have noticed fisrtly was a little lovely black bag with the golden details which attracted my eye so much. And those two lovely blouses, espeacially white one, it's my favourite from now ! Of course I will decorate it a little bit. So, what do you think about it guys? And do you like to buy clothes in those second-hand shops? Iki konkurso pabaigos liko mažiau nei savaitė.Nepatingėk ir sudalyvauk konkurse ! Kokie lobiai iš second-hand'o :) Įdomu labai kaip atrodo ta balta bliuska ant tavęs. Love the shirt so romantic ! !